The 2017 CHLOE report is the first of its kind, and, therefore, sets a benchmark that will allow interested parties to track the continued evolution of online learning. The study involved a questionnaire sent to 1000 “chief online education officers”, or COEOs — those individuals at institutions of higher learning who are most at the center of institutional planning and decision-making with regard to online learning. We’ll be chewing on what the research reveals for some time, but some initial insights leapt out at us. Enrollment is increasing, but growth is slowing - how will you compete? One is a heads up on the shifting ratio of supply vs. demand in higher ed online education. 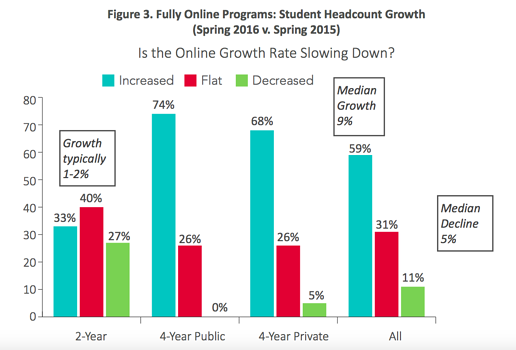 The CHLOE research indicates that, while student enrollments continue to increase, the rate of that growth is slowing down. 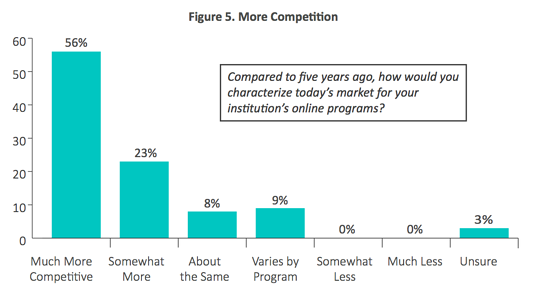 At the same time, the majority of institutions surveyed indicated that they plan to “substantially expand” their number of online programs. What does this mean? If these trends continue, it’s only a matter of time before the supply of online programs begins to exceed demand. It doesn’t take a Ph.D. in economics to see the implications. Supply exceeding demand creates a more competitive environment on the supply side, a situation already being perceived by those in charge of online learning. In fact, 56 percent of chief online education officers thought that online learning has become “much more competitive”. We think there are too many cookie-cutter online courses, and universities need need to invest in courses and programs that are engaging, modern, and differentiated. We choose both, you should too. In six out of seven areas, COEOs indicated that their institutions are currently focused on stability rather than innovation, the exception being operational models, which they continue to explore (we’ve written about this previously with regard to OPM contracts). These schools do not anticipate major changes in their online strategy, quality assurance, pedagogy & technology, course design, outcomes metrics, or costing & pricing. In addition, mainstream institutions showed little interest in adopting the latest tools and strategies. Which makes us wonder: how will they compete? It’s quite possible that competitive pressures haven’t yet built to a point where established programs are ready to leave the safety of the tried and true toward doing what’s necessary to secure (or re-secure) their place on the leading edge of online education. If these trends continue, however, innovation may not be optional, but a matter of survival. When that happens, ExtensionEngine will be there, ready to lend a hand to elite institutions who want to maintain their leadership positions in the online learning universe. Are the risk takers willing to take on transformative change? Speak with ExtensionEngine on how we support you in creating differentiated online learning that will stand out. Let’s talk. Continue reading: One of the most important — and most complex — decisions in online learning is with whom to partner and how the financial side of the partnership will work. Download our White Paper and we'll show you a thirty-point financial model on OPMs versus fee-for-service, unbundeled models.